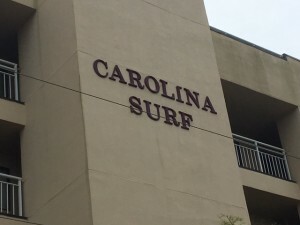 On June 30, 2017, the Star News reported that the Carolina Surf condominium complex in Carolina Beach was condemned and an evacuation was ordered after an engineer found serious structural deficiencies in the building, which could cause its collapse. This was according to a news release from Assistant Town Manager Ed Parvin. The Star News wrote that Parvin said: “Town staff and the homeowners association worked together to safely remove the occupants from the building and secure the area.” Fire Chief Alan Griffin said the fire department had been working with the evacuation. The address of the building is 201 Carolina Beach Ave. S., and the Focus Matters Realty website indicates that the ocean front units sell for between $250,000 to $350,000. The Star News wrote that “Parvin said the issue with the condos came to light several weeks ago after ‘significant corrosion’ was detected on steel exposed when contractors removed a portion of the stucco siding while replacing windows on the building, Parvin said.” Town staff requested an engineering evaluation, he said. A later engineer’s report of other parts of the building presented to the homeowners association revealed the building was “in significant danger of collapsing,” he said. The Homeowners will likely incur substantial costs to repair or replace the building, and there may be legal avenues to recover the damages in such circumstances. If you or someone you know may be in a situation such as this, please call Collins Law Firm for a free confidential consultation at 910-793-9000.